According to the NACS, the ability to sell E15 gives retailers the chance to offer their customers a wider range of fuel options. More retailers are expected to offer the fuel blend once it can be sold year round. In Iowa, two companies were recently recognized with biofuel marketing awards. Casey's General Stores received the 2019 Ethanol Marketing Award, while Quick Oil Co. was awarded the 2019 Biodiesel Marketing Award. 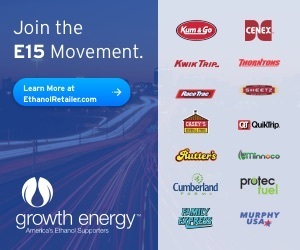 As the EPA prepares its rule to allow year-round sales of E15, ACE will be bringing experienced E15 retailers to a variety of fuel marketer and c-store conferences this spring to help retailers understand how easy and affordable it is to offer E15. Late last year, it was reported that Marathon Petroleum Corp. was considering selling E15 at some of its retail locations. While the company has failed to confirm that news, those in the ethanol industry say the reports—if true—could be a good sign. The Renewable Fuels Association is using its "superpowers" to help fuel retailers verify the compatibility of underground storage tanks, dispensers and other infrastructure as they consider offering higher blends of ethanol. An analysis commissioned by the Urban Air Initiative and completed by Future Fuel Strategies looked at nearly 100 vehicle emissions studies and concluded that the test fuels used often do not match the real-world fuels available to consumers. American drivers continue to rely on earth-friendly and engine-smart E15 to fuel their lives. Consumers across the U.S. have logged a total of 7 billion miles on the fuel and show the resounding success of E15. Federal forecasts in the U.S. EIA's newly released Annual Energy Outlook 2019 (AEO2019) underscore the importance of delivering cleaner, lower cost options to the fuel pump, said Chris Bliley, vice president of regulatory affairs at Growth Energy.